Turrall Fly Pod Blob Selection, Love them or hate them, the blob is without doubt the most widely used modern still-water fly fishing lure. The Flies, in the Turrall Fly Pod Blob Selection are all tied with modern translucent blob chenille, and all have around 12-14 turns on a competition size 10 hook. Also included are the new foam-arsed blobs. 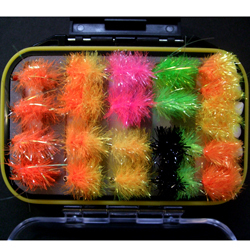 Turrall Fly Pod Blob Selection contains 22 flies in 8 variations.